SURFACE ozone is produced as a result of chemical reactions in the atmosphere, driven by the action of ultra-violet (UV) radiation in the sunlight, involving both nitrogen oxides (NOX) and volatile organic compounds (VOCs). While both Nox and VOCs are emitted in large amounts by motor vehicles, other important sources of VOCs include solvents used in industrial and chemical processes. 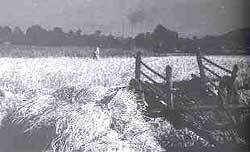 The British team comprising J N B Bell, M R Ashmore and R Maggs, of the department of biology, Imperial College, London, in collaboration with A Wahid and S R A Shamsi, of the department of botany, University of Punjab, Lahore, studied the impact of ambient air pollution on wheat and rice yields in the vicinity of Lahore. Their study demonstrated reductions of 42 per cent and 37 per cent in the case of grain yields of two cultivars of rice (Oriza sativa L) and 46.7 per cent and 34.8 per cent in the grain yields of two cultivars of winter wheat (Triticum aestivum L). Says Bell, "The very large yield reductions found in this study and the fact that surface ozone - a secondary pollutant that can spread in high concentrations over rural areas may be a major contributor to the observed effects - suggests the potential impact of air pollution". The British team made similar observations while studying the impact of surface ozone on Egyptian varieties of vegetables in Alexandria. "A comprehensive scientific study on crop losses due to air pollution, particularly the impact of surface ozone in developing countries, is most urgently required. This will help in a generic analysis of the issue, which is essential for assessing the scale of the problem at national and global levels, as also for providing an environmentally sound basis for agricultural policies," argued Bell while addressing a workshop on the effects of air pollution on crop yields in India, organised by the School of Environmental Sciences, Jawaharlal Nehru University, New Delhi. The British team's visit to India was aimed at soliciting the assistance of Indian scientists on a project that would seek to examine the relation between air pollution and agricultural production within the country. India was selected for the proposed study because the problems of air pollution and its impact on the country's vegetation has been a subject of interest for the past several years. Also, a number of research groups are already working in this field. But - according to Ashmore - little has been done by way of establishing the effects of surface ozone on crop physiology and growth in the rural areas. The ambitious proposals put forth by the Imperial College team , during the course of the two-day seminar, generated considerable interest among Indian scientists. The propositions included a plan to collate data on air pollution levels in India and extend measurements of surface ozone and nitrogen oxides to more rural sites. Six research centres were to be established throughout the country to conduct experiments in rural locations to assess the impact of surface ozone on crop growth, apart from identifying local cultivars; of major crops which may be sensitive or resistant to air pollution, among others. But the enthusiasm diminished towards the end of the second day of the conference because the British team ultimately announced that they could offer a grant of just Rs 600,000 through the Overseas Development Administration (ODA) for the research to be conducted over a period of two years. The limited funding substantially scaled down the objectives of the Indian case study to a mere reviewing and synthesising of the existing data available on the subject, The results of the case study would be used to evolve a project proposal for soliciting additional external funding at a later stage.